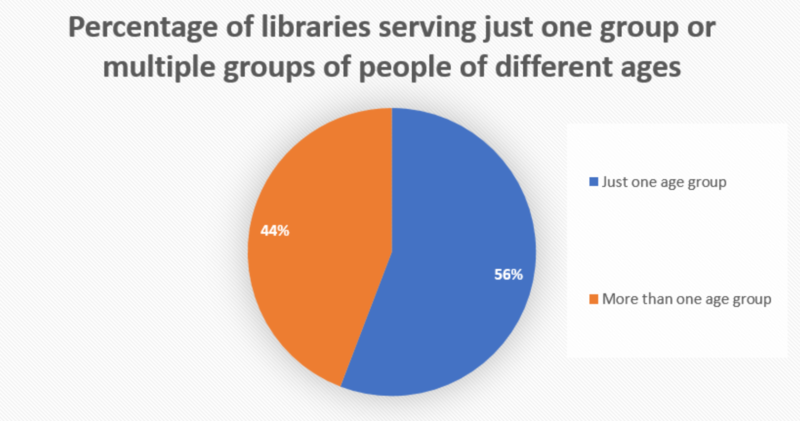 “As part of our ALSC mentorship, AnnMarie Hurtado from the Pasadena Public Library and I, an MLIS student at San Jose State University’s iSchool, created a survey about the use of creative writing programs, specifically for children, in public libraries. Both of us write as a passion, and I used to attend creative writing programs at my local library both as a child and teen, so we were both curious as to how public libraries encourage writing—especially now that many libraries are (rightfully) moving full STEAM ahead. 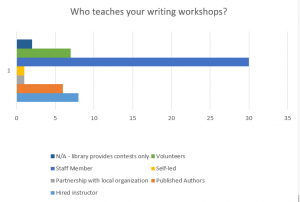 Our main interest was in the kind of creative writing programs libraries held, and what the goals of those programs were—were they more educational, or designed for attendees to flex their creativity? Were they run by staff members, or did they give kids the chance to talk to real live authors? We shared our survey on three Listservs: CALIX (calix@listserv.cla-net.org), ALSC (alsccolmgt@lists.ala.org; alsc-l@lists.ala.org) and PUBYAC (pubyac@lists.lis.illinois.edu), and included questions about who taught the creative writing program (staff member, volunteer, paid professional, etc. ), what resources are used to prepare for the program, the age range of participants, and what the overall goals of the programs were. 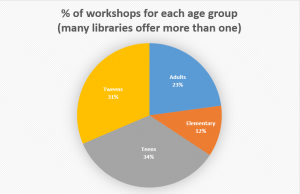 We received 43 responses from librarians all over the US and Canada. 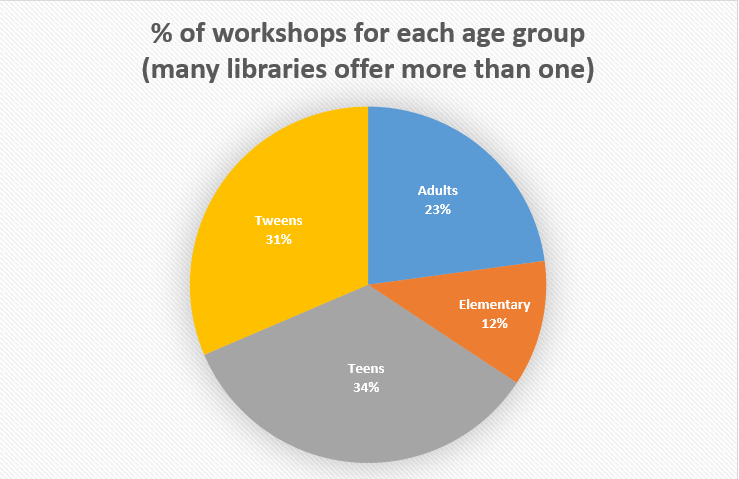 The survey was not restricted to children’s creative writing programs, but the majority of responses listed children or teens as their targeted age group, with six programs open to all ages, six libraries holding separate programs for children/teens and adults, and three libraries with adult-only programs. Whatever the intended age group of the programs, their main goal was overwhelmingly to give attendees the chance to experiment. In multiple-choice list where responders were allowed to choose as many options as they wanted, and were able to include their own custom response, 41 out of 43 chose that the program’s goal was to give attendees the chance to try something new. 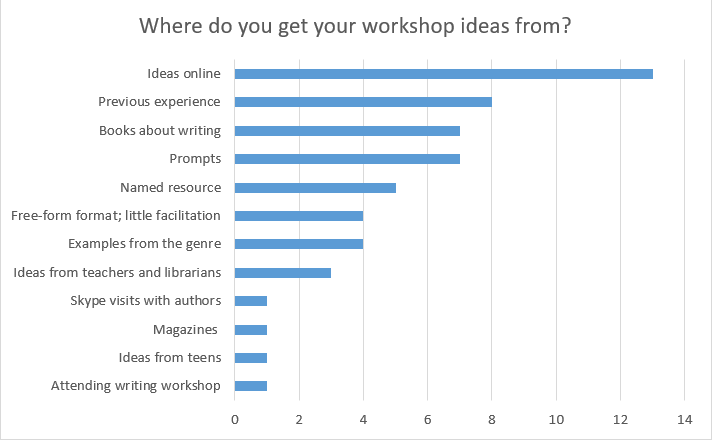 The other options were for attendees to receive feedback on their own writing (36 of 41), collaborate with peers (33 of 41), learn a writing technique or concept (32 of 41), and the option with the lowest response rate was to give attendees time to work on a project (28 of 41). It seems like there are three main types of writing programs offered: programs that are designed to teach children about writing, led by a certified teacher, published author, or staff member with a background in writing; programs that are designed to introduce attendees to writing, and gives them the space to try writing creatively without the pressures of being graded or judged; and peer critique groups, where attendees bring a work-in-progress and receive feedback from other attendees, but don’t actually write during the program. To learn more about the types of programs offered and the preparation behind them, we asked what resources were used by staff and volunteer-run programs. As well as educational resources, responders listed resources that provided writing prompts and inspiration, such as Pinterest, blogs, and various writing games. What is especially interesting is how many responders (20%) said that ideas were generated either from the program leader or the participants themselves. 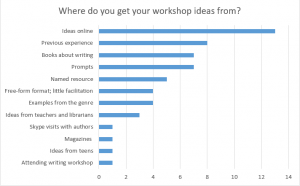 This, combined with the amount of libraries that use inspiration-based sources rather than education-based, shows that many of the programs are looking to help generate ideas and offer constructive feedback, rather than teach attendees how to write. But are these free-form, idea-based programs more of a necessity than a choice? Thirty out of forty-one responders said that their programs are run by a staff member, and seven said they were run by volunteers—it’s possible that these program leaders do not feel equipped to “teach” a writing course, and so revert to writing prompt ideas. However, it should be noted that at least eight of the thirty-seven staff members and volunteers are either published writers or have degrees in English and/or creative writing, and so would be equipped to teach in some capacity. 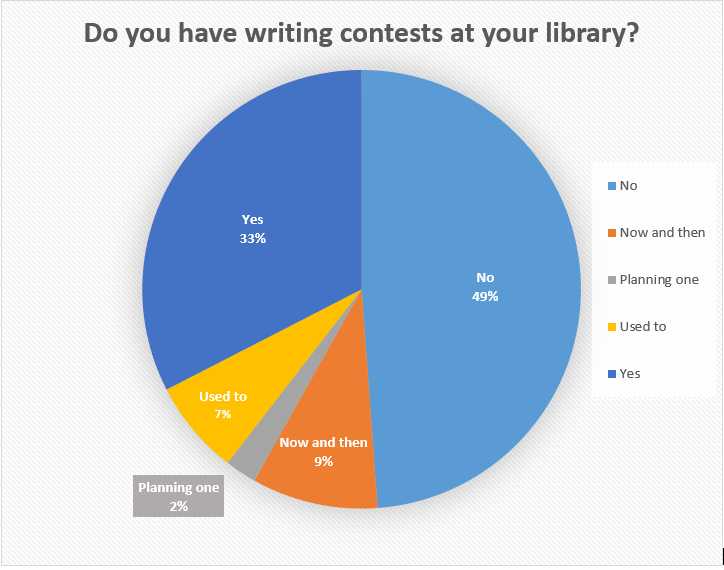 We also asked about writing contests and publications, which received varied responses. The libraries that did not offer contests cited the age group and lack of participation as reasons, but one responder made the point that they want to “avoid turning writing into a competition. It was wonderful to watch young writers realize how very ‘okay’ it was to allow others to offer help…many thought that was cheating!” The libraries that do offer contests make the point that they can be a fun way to partner with local organizations and stir up excitement in the community. But contests, especially for young or brand new writers, can also discourage them from writing—especially if they lose. It is possible that turning writing into a contest can reinforce the culture of testing and good grades and pressure children to succeed much too early in their writing career. The responses to publishing writers’ work was equally split: 51% of responders said no, 42% said yes, and 7% said that they don’t at the moment, but plan to in the near future. 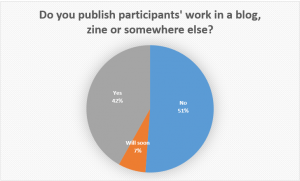 Those who answered yes said that they publish their participants’ writing on the library website and as print zines and books—some of which are added to the circulating collection. Unlike contests, publication encourage budding writers to continue. Their work isn’t judged or graded, and having your work published—especially when that published work is then available to the public—can be a huge self-esteem boost, confirming that your writing is worth reading. The idea of using creative writing programs as a way to get attendees, especially children, to be creative without fear of grades follows the recent trend of STEAM programs in libraries. Children want to use their imaginations. They want to play with their own ideas as much as they want to play with Legos or baking soda explosions. As a kid, I used to write as a sort of game I played with myself, because when I wrote I could live out the story that I wanted, without any limits. One of the greatest benefits of creative writing and STEAM programs—and of the library as a whole—is that children have the freedom to experiment and fail in a way that they can’t at school. In the drudge of standardized tests and the pressure to succeed, it is liberating to have a place where you can just sit down and write.